Spring is finally here and along with it starts the cascade of vibrant superfoods. Obviously, some take a little longer than others to hit the grocery store, but here are my picks for the top 10 spring superfoods and lots of reason to start enjoying them as part of your regular diet. 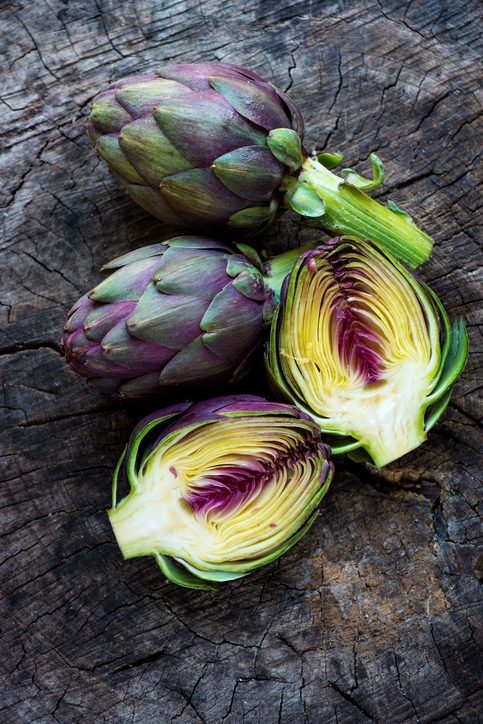 A medium-sized artichoke is loaded with fiber (about 10 grams) and vitamin C. It also contains plentiful amounts of the heart- and muscle-health minerals magnesium and potassium. It’s also high on the ORAC list of foods that have high antioxidant values. High amounts of antioxidants translate into reduced free radicals linked to aging and disease. Artichoke leaves have been found in research to help regulate cholesterol and triglyceride levels. Artichokes contain a nutrient known as cynarin which helps to increase bile production in the liver and may be helpful in the reduction of cholesterol and heart disease. An excellent source of nutrients like vitamin K, which is necessary for bone health and folate, asparagus also contains good amounts of vitamins C, A, B1, B2, niacin, B6, manganese, potassium, magnesium and selenium. Its high folate content makes it especially good for pregnant women who have higher folate needs than most people. Next to onions, asparagus is the highest source of the plant nutrient known as quercetin—a potent nutrient that is beneficial for allergies, asthma, bronchitis, cancer, lung conditions, rhinitis and sinusitis. That makes it the perfect food to eat to help you cope with spring allergies and allergy-related asthma. Asparagus is also rich in asparanin-A, which is an anti-inflammatory compound that helps to improve immune system health. As if that wasn’t enough reason to start eating more asparagus, the vegetable contains several other anti-inflammatory compounds to help you boost your overall health. When you consider that everything from arthritis to cancer, diabetes to heart disease, and even depression are increasingly linked to inflammation, you’ll want to make anti-inflammatory foods like asparagus a regular on your dinner plate. Potent in antibacterial, anti-yeast and antifungal compounds, chives have many similar properties to its relatives garlic and onion. Chives also help boost glutathione levels in the body. Glutathione is a powerful detoxifier and anti-cancer compound. Chives have been found in multiple studies to be beneficial for cancer prevention and in the treatment of the disease, particularly for gastrointestinal cancers. Researchers at the National Cancer Institute and the US Department of Agriculture believe that the sulfur compounds found in chives are most likely responsible for the herb’s anticancer effects. The herb has been found to stop the proliferation of cancer cells as well as halting or slowing the spread of cancer. Like other members of the allium family, chives is also highly antibacterial. Research shows it has antibacterial activity against many strains of bacteria, including Staphylococcus, Listeria, Salmonella, Campylobacter and E. coli. Research shows that collard greens are among the best foods for lowering cholesterol levels due to its superior ability to bind to bile acids in the intestines. Collards also show excellent anti-cancer properties thanks to its naturally-occurring components, including: glucoraphanin, sinigrin, gluconasturtiian and glucotropaeolin. Collard greens were found in a study of a dozen vegetables to have the fourth highest amount of antioxidants that help us slow aging and fight disease. Research by the US Department of Agriculture found that collard greens are the most economical of all the cruciferous vegetables when compared by price per cup of vegetable. So, if you’re looking to maximize your nutritional value while on a budget, collard greens are a great way to go. Proven to lower the risk of bladder, breast, colon, ovary and prostate cancer, kale is among the best superfoods available. Great for building healthy bones largely due to its high calcium content, kale also improves the body’s detoxification systems by increasing isothiocyanates (ITCs) made from the vegetable’s glucosinolates. Researchers have identified over 45 phytonutrients in kale, including kaempferol and quercetin, giving it impressive antioxidant and anti-inflammatory properties. If you are suffering from eye problems or simply want to eat to preserve your eye health, you’ll want to make kale a regular addition to your diet. That’s because research shows that kale has the highest amount of lutein out of 5350 foods tested. Lutein is a potent carotenoid that helps protect eyes and is beneficial in the treatment of glaucoma and macular degeneration, two common eye conditions that tend to be linked with aging, but are also likely linked to long-term nutrient deficiencies, in my opinion. High in fiber, vitamins C and K, calcium, potassium, magnesium and manganese, rhubarb stalks (not the leaves which are poisonous), rhubarb is an excellent spring food but most people don’t know what to do with it. Sorry, dumping cups of sugar into it for jams and pies wrecks any superfood qualities this food might otherwise have. I enjoy it stewed or added to chutneys with a touch of the natural herbal sweetener stevia for taste. Not just for Popeye anymore, spinach is high in iron, calcium, beta carotene (which turns into vitamin A in your body) and vitamin K, which is important for bone and blood health. The chlorophyll gives spinach their green color and is a powerful blood cleanser. High in neoxanthin, which is proven to aid prostate health, spinach also contains the phytonutrients lutein and zeaxanthin, which strengthen the eyes and help prevent macular degeneration and cataracts. Spinach is also one of the best sources (3rd highest) of vegetables tested for their folate content. Spinach is also high in natural compounds called thylakoids, which help to regulate ghrelin in the body—a compound that helps us feel full longer and encourages us to eat less, making spinach the ideal food for those looking to lose weight. While grains and seeds are often cited as rich sources of vitamin E, spinach ranks second highest in some nutrition studies. Spring greens contain high amounts of vitamins A, C, vitamin K, folate, calcium, potassium and iron, as well as lutein and zeaxanthin needed for strong bones, muscles, a relaxed nervous system and healthy eyes and vision. Like spinach, they also contain the blood cleansing phytonutrient chlorophyll. Eating more salads on a regular basis has been found to help fight breast cancer and boost heart health. Just eight strawberries pack more vitamin C than one orange. That’s because strawberries are among the richest sources of this essential antioxidant nutrient that helps to protect our bodies from free radical damage linked to aging and disease. Whether you want to evade heart disease, arthritis, memory loss, or cancer, these berries have proven their ability to help. Research also shows that strawberries help to regulate blood sugars, making it a good food choice if you have low blood sugar, high blood sugars or diabetes, metabolic syndrome, or are trying to lose weight. If ever there was a vegetable made for smokers, watercress is it. In a study published in the American Journal of Clinical Nutrition, researchers found that eating raw watercress daily increased the ability of cells to resist free radical damage to DNA, which reduces the risk of cell changes linked to cancer. Their research showed that this protective benefit was pronounced in smokers. But, anyone can benefit from this spring nutritional powerhouse. It is also high in beta carotene (essential for skin and eye health), B-complex vitamins (important for nerves, energy and mood balance) and vitamin E (critical for skin and immune system health). Watercress is one of the vegetables that contains a group of nutrients known as isothiocyanates, which have anti-cancer properties. Watercress also appears to disrupt signals from cancer tumors to grow new blood vessels that feed them. 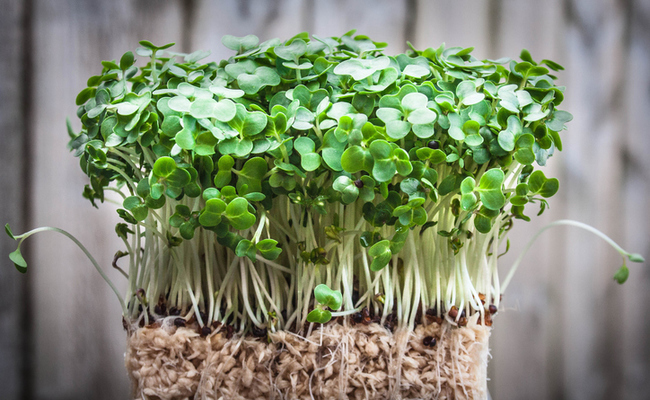 Halting this process is critical in the treatment of cancer, suggesting that watercress may offer hope in the treatment of this serious illness. In animal studies an extract of watercress was found to regulate blood sugar and blood fat levels, offering potential help for those suffering from diabetes or heart disease. Dr. Michelle Schoffro Cook, PhD, DNM is the publisher of the free e-news World’s Healthiest News, president of PureFood BC, and an international best-selling and 20-time published book author whose works include: The Cultured Cook: Delicious Fermented Foods with Probiotics to Knock Out Inflammation, Boost Gut Health, Lose Weight & Extend Your Life.